I started this blog a few weeks ago and have been making updates to it as much as I could with a lot of different posts about everything and anything – there wasn’t just one set topic. Well, one day I figured I’d make a post about Making A Murderer because like a lot of other people who watched it, I didn’t think Steven Avery and Brendan Dassey should be sitting in jail because of the reasonable doubt. After I make the first post, I browsed /r/MakingAMurderer and was reading through all the different theories – and that’s where I started posting the most interesting/plausible/intereging posts – and the posts are both Pro and Anti Steven Avery – I just want to show how it’s possible that there could be many different suspects besides SA. So, this morning (1/29/16), I was on my laptop as I usually am when I wake up in the morning and was reviewing the inbound logs and came upon the Department of Justice (DoJ)! They even stayed on here for 10 minutes! Now, I understand that it could be any random employee who works there and it has nothing to do with the case at all, but I just found it interesting. I’m not trying to insinuate anything. I’m not trying to get myself put on a list. I’m not trying to piss people off. 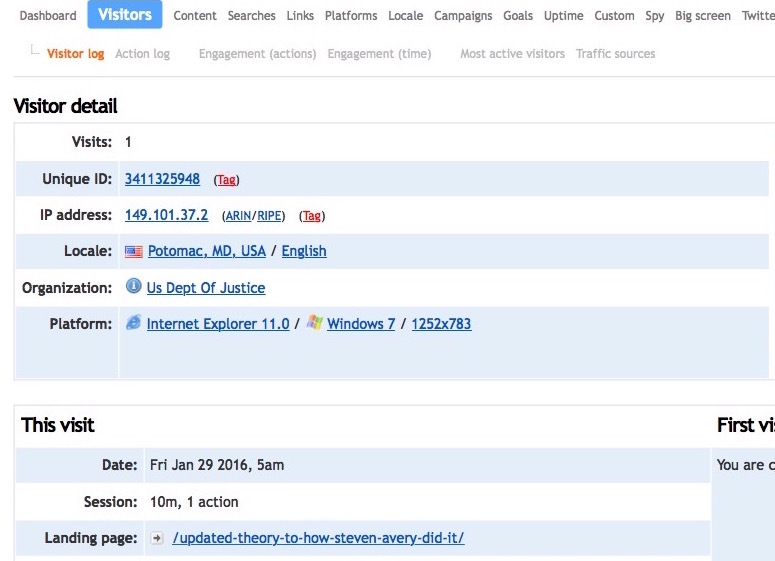 I just thought it was interesting that the Department of Justice visited my blog! I did post the topic on Reddit and they have different reasonings behind it as well – some think they’re looking into it, some think my our tax dollars are paying somebody to read my blog (which is cool)… so many theories, just like this case!